I will maintain until the day they pry the mouse from my cold, dead hand that Dark Messiah of Might and Magic is a criminally underrated game. So I was naturally intrigued by Hellraid , which by all appearances shares many similarities with Dark Messiah: Specifically, the bloody, fast-paced combat through expansive, RPG-style dungeons. But it's most definitely not, as this gameplay trailer makes clear, an RPG: Visual trappings notwithstanding, it's all about thefaux-medieval fantasy face-busting. The "clobber, collect and continue" styling means Hellraid probably isn't going to be the deepest game ever, but the crumbling catacomb motif is awfully pretty, and while it's tough to effectively simulate melee combat in a first-person videogame, it looks reasonably varied and fluid. Will it be any good? 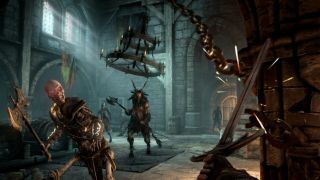 The tactile nature of first-person sword-swinging makes it impossible to judge without actually playing, but I'm cautiously optimistic, especially since Techland appears to be putting real effort into it: The studio announced in April that Hellraid was being upgraded to the Chrome Engine 6 , which will enable physics-based lighting effects, better AI and a greater level of detail and complexity in the character models and animations. Hellraid is slated to hit Steam: Early Access this fall, with the full release scheduled for 2015.